The FDA reported that as of Feb. 1, the agency had received 359 reports of a cancer of the immune system, called anaplastic large cell lymphoma (ALCL), linked to breast implants. According to the FDA the risk for the cancer appears to be higher with textured breast implants as opposed to smooth ones. Breast implants is one of the most popular plastic surgery procedures in the U.S. About 300,000 women in the U.S. get breast implants each year, and lymphoma cancer from the implants is rare. There are two types of breast implants that are approved in the United States by the FDA, saline or silicone gel-filled implants. All breast implants have an outer layer that is made of silicone, but they can have different shapes, sizes and textures. They can also vary in thickness. One of the most common side effects associated with breast implants is capsular contracture, when scar tissue forms around the breast implant, making it hard and tight. Capsular contracture, can affect the shape and the look of the breasts, and in some cases be painful. Some plastic surgeons believe that a textured implant prevents the build up of scar tissue. Why are textured implants have a higher risk for cancer? 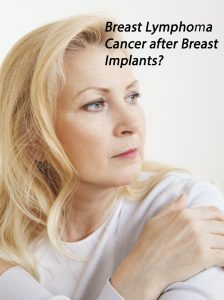 According to the FDA, the exact mechanism for higher cancer risk is unclear with textured implants. Some research has indicated that textured implants are more likely than smooth implants to develop a bacterial coating, which may increase the risk of infection, cancer, or implant failure. Breast implant-associated ALCL may present with persistent swelling or pain around the implant. The signs and symptoms can appear years after the initial implant procedure. The lymphoma cancer is rare, but women should also be aware of the fact that the FDA does not consider breast implants to be procedures that last a lifetime. Many women tend to have repeated breast implant surgery because of implant failure, leakage of the breast implant gel or saline, shrinkage, movement out of place because of aging skin and loss of skin elasticity and scar tissue build up. The Dr Shezad Malik Law Firm based in Fort Worth, Dallas Texas is investigating and accepting breast anaplastic large cell lymphoma injury cases from breast implants nationwide.